It’s April! That means 30 Days of Biking and biking every day and hopefully blogging about it each day. Had we set out early in the day per my original plan we would have stayed dry. Unfortunately after a long week I was pretty worn out so we stayed in until 2pm and ended up getting caught in horrible rain. I saw that it hailed in some spots, but our rain was heavy and cold, but not quite hail. 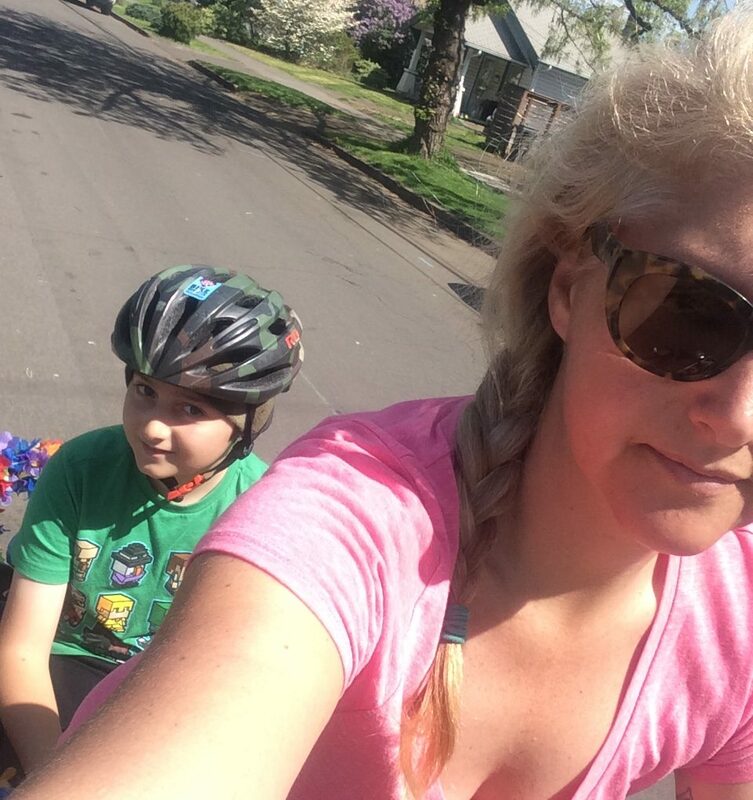 But there were also some spells of sunshine and my eight-year old and I biked in short sleeves for part of the day. When we got home from our sushi lunch and our visit to the Bricks & Minifigs Lego store I told the kids how many miles we’d covered! Except only I covered that many miles. I carried the little one half of the way outbound and the big one most of the way inbound. At least I didn’t have to carry them both at the same time. And the little one is back to riding no-hands again. I momentarily got him to agree to keeping hands on the bars in the rain, but that oath wore off. No falls, though! April is winding down and May Walk + Bike Challenge Month is right around the corner! After bringing the kids to school I spoke about our exciting upcoming events at the Friday Morning Meeting. 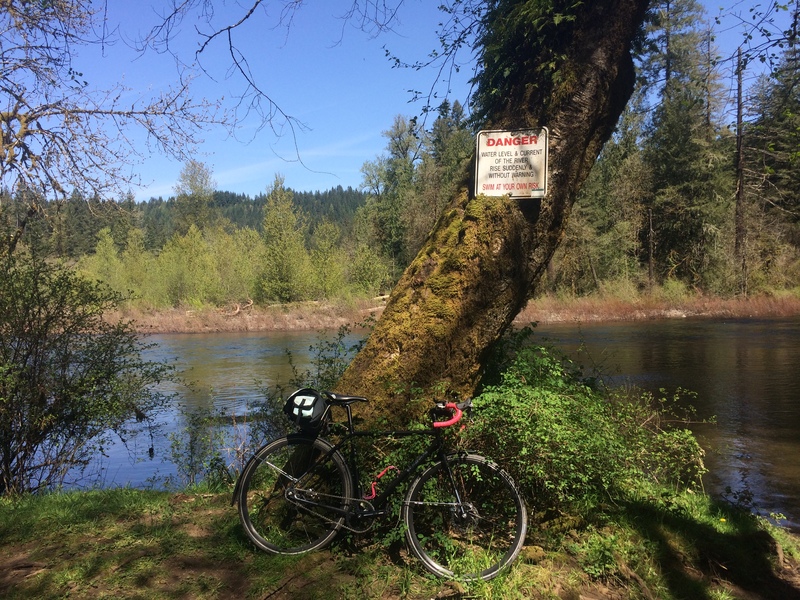 Then I hung a bunch of posters before heading north to meet with Sara for a Kidical Mass PDX meeting. And on the way home I hit a sporting goods store for cones and tennis balls (to cut in half) for our May bike rodeo. Bike: Surly Big Dummy. Shortly thereafter I picked up my third grader from school. The drizzle had just stopped, but it was still cold so I have no idea how he was happy in short sleeves. Bike: Surly Big Dummy. Then I fetched my fifth grader a couple hours later. We both bundled up appropriately. Bike: Surly Big Dummy. And one bonus round trip to school in the evening for the art show. It was still light when we headed home so it was easy to find the Northern Flicker we heard pecking on a utility pole. 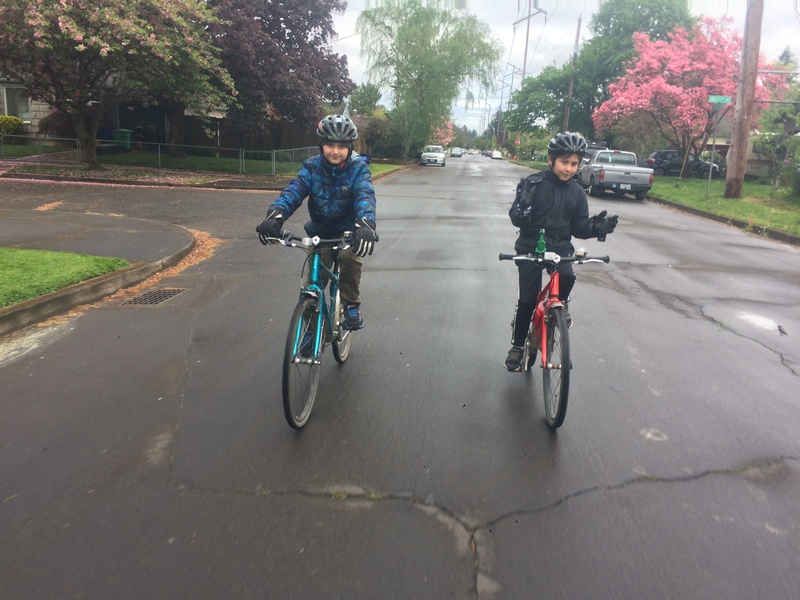 Then disaster struck as my eight-year old took his first spill since he took both hands off his handlebars a few months ago. 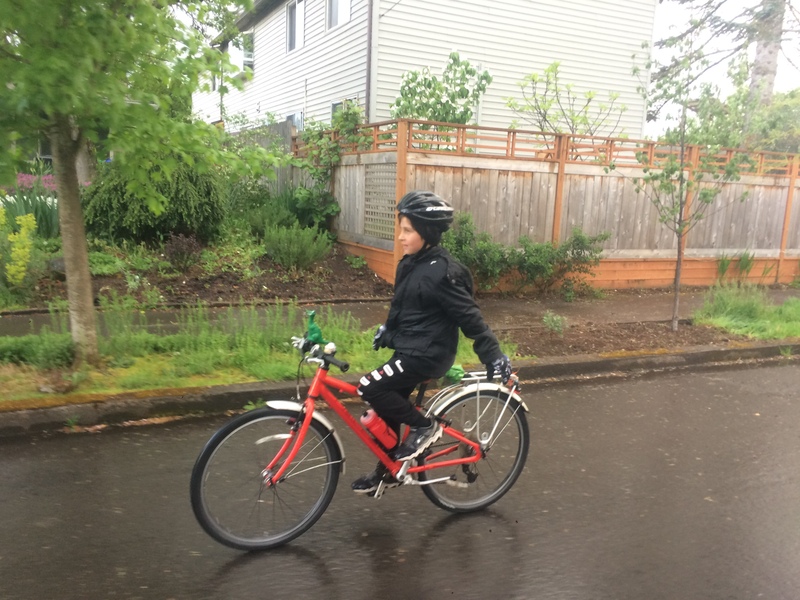 He’s getting better and better each day and this evening turned a corner no-handed and looked back distractedly at his brother no-handed twice…well, once…the second time was when he went down. But he was pretty much fine and amazingly wanted to keep riding home. I think he kept his hands on his handlebars those last five blocks at least! I’m pretty sure he’ll have forgotten the whole thing by tomorrow. His favorite things are holding his hands out to the sides, linking them behind his back, and slow clapping. Bike: Surly Big Dummy. Last of the four sunny days in a row! There were 34 bikes at the racks today. And I saw three other cargo bikes on my side of the building at pickup. I wonder what tomorrow will be like when it’s 30 degrees colder. 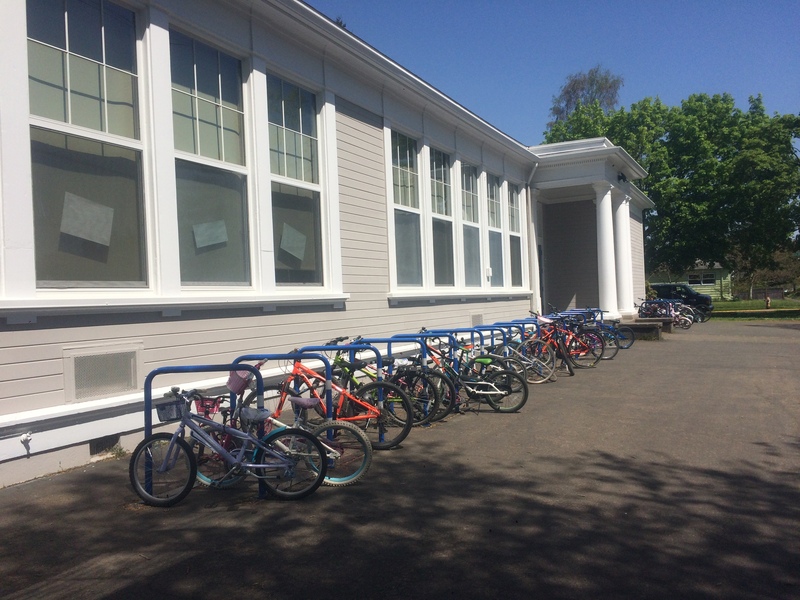 The kids were so hot when they got out of the building they couldn’t even walk around the corner to the bike rack. I carried them around the corner and the little one was cool to ride along home from there, but I kept the big one and his bike on my bike. Pixie and I stopped to admire this new stop sign after dropping off the kids. It stops cross traffic on our school route and since it’s new, it’s adorned with attention-grabbing orange flags. 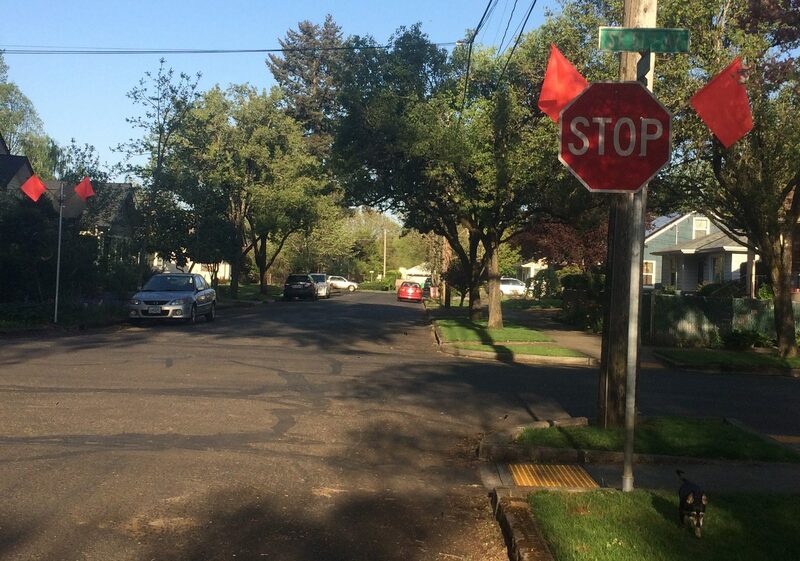 I like how some stop signs are offset to get them out from behind visibility-blocking foliage. Bike: Surly Big Dummy. 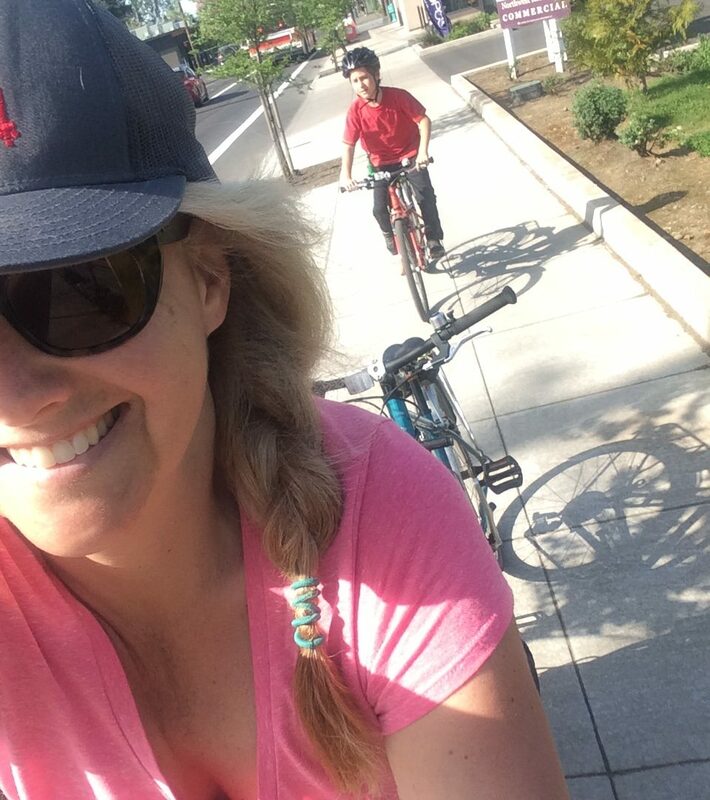 Before I could get out to run errands I got a call from school that my 5th grader had fallen and hit his head so I pedaled over to pick him up. 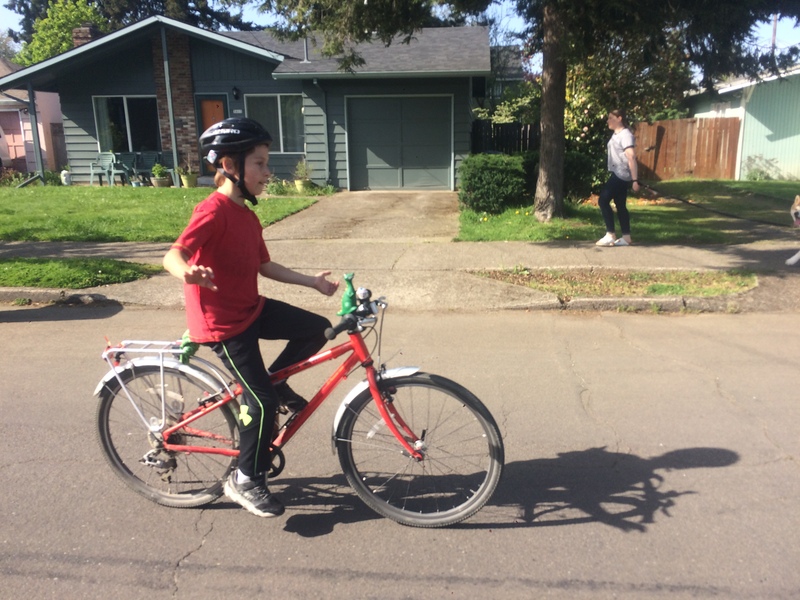 He’s totally fine, but he wanted to come home so we left his bike at school and he got to watch me do yard work and housework for the bulk of the day. Bike: Surly Big Dummy. Later on I grabbed the other kid and the first kid’s bike. 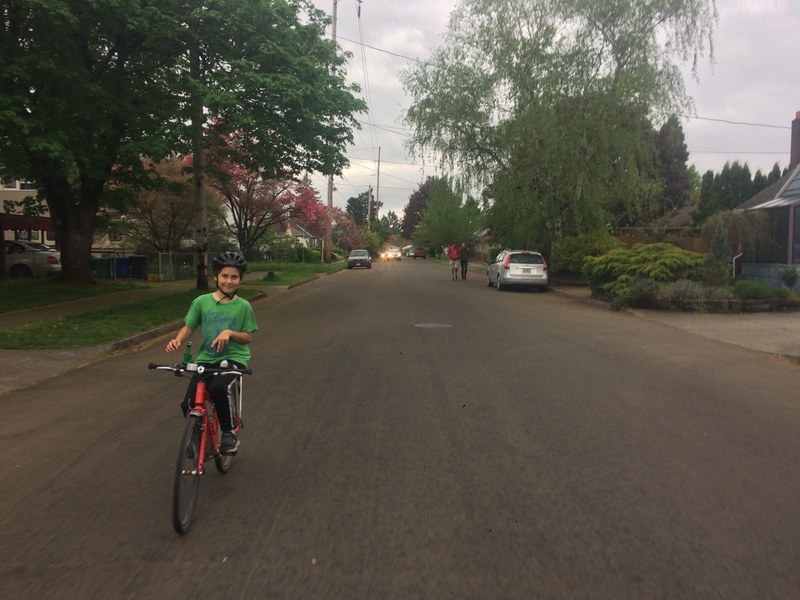 It was pretty hot out (84) so we took the most direct route possible (though that meant a couple blocks of sidewalk along two arterials) and rode fast…per the kid’s request. 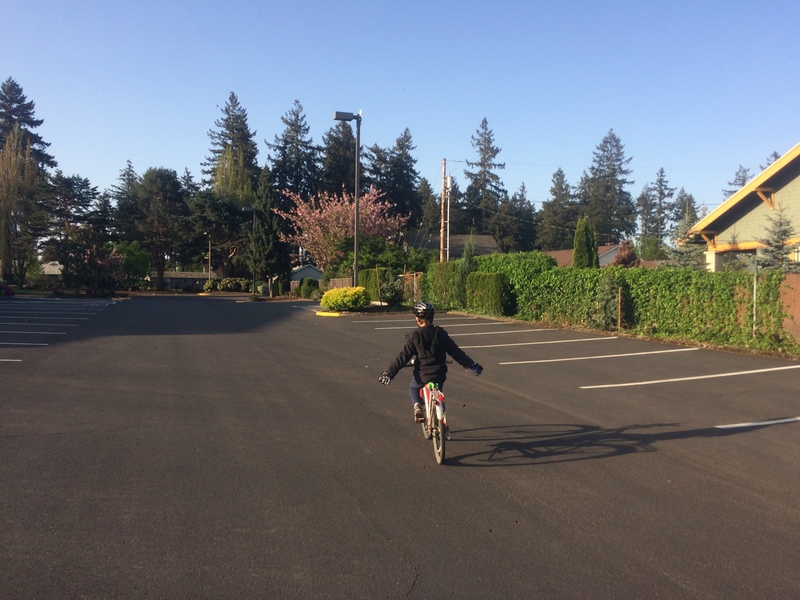 My kid has been working on riding no handed lately and discovered it’s easier when going faster. (I think it’s hard no matter what.) Bike: Surly Big Dummy. 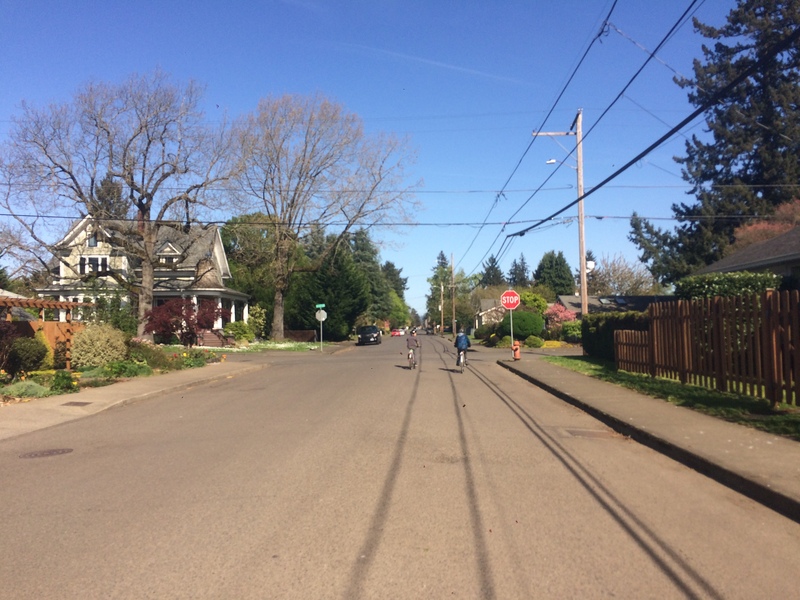 After dropping the kids at school I continued on to NoPo (North Portland) to get some used Xtracycle FreeLoader bags from a dad with a Big Dummy. He ended up with the Surly bags and I get to replace my just-about-dead FreeLoaders with a much younger pair! But I’ll probably wait until my old bags completely disintegrate before making the change. 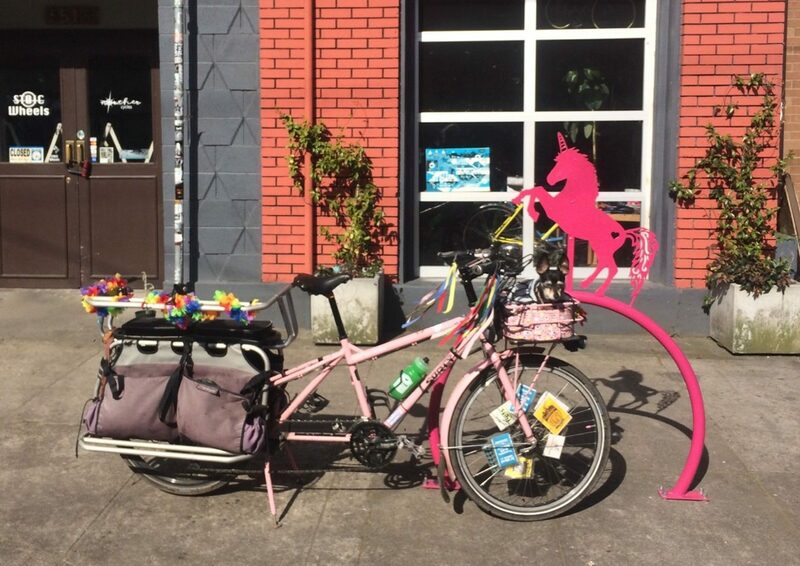 Since the pink unicorn bike rack in front of Norther Cycles was on our way back, I brought Pixie and my pink bike by to see it. Bike: Surly Big Dummy. 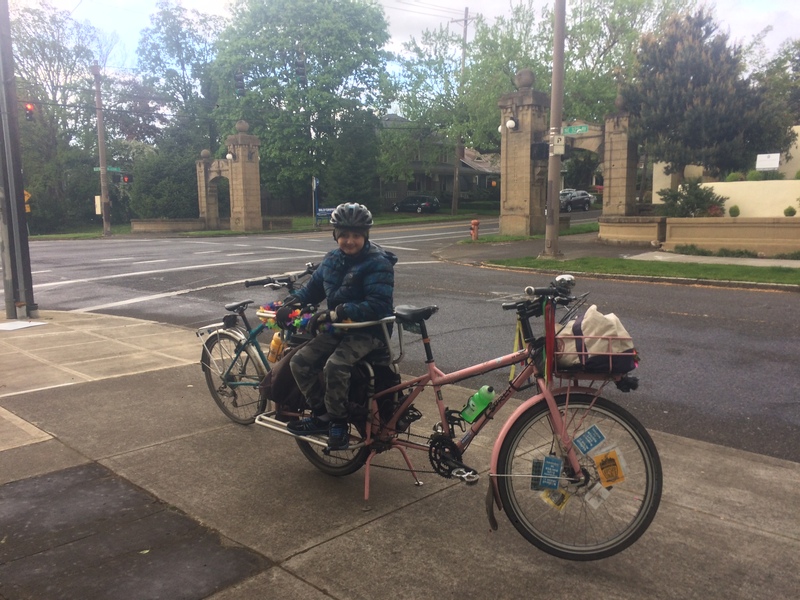 A bit after the school run (bike: Surly Big Dummy) I headed down to Sellwood to distribute Kidical Mass PDX CycloFemme flyers. Bike: Surly Big Dummy. First up: school run. Bike: Surly Big Dummy. Fresh off our camping trip (which was freezing and we’re not going camping again any time soon) I was inspired to check out one of the local spots: Dodge Park. 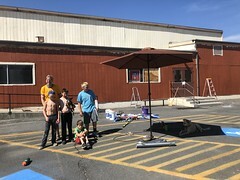 Kidical Mass PDX has camped here in the past and will camp here again this July and I got route advice from a local dad. I liked the route and it was much better than the route to the one other campground I checked out (Barton Park). 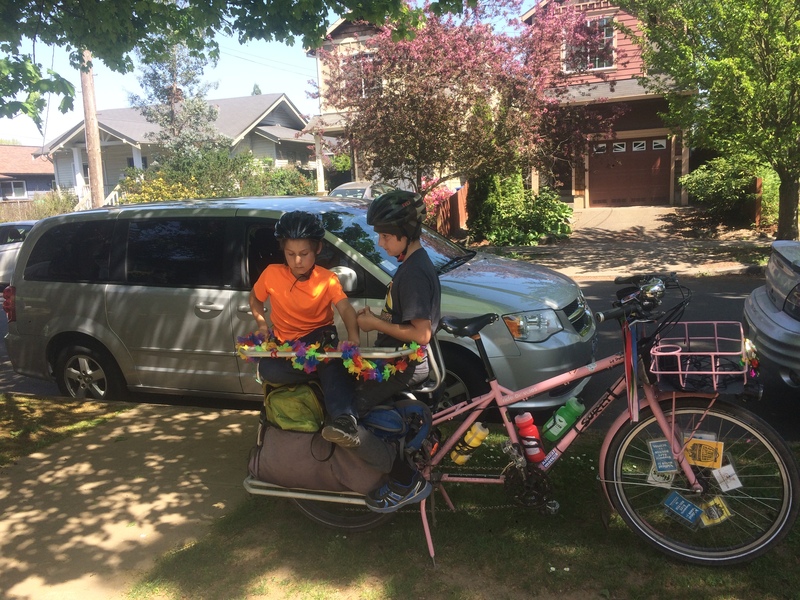 I took my single speed and figured it’d be a good test for riding the cargo bike with all the gear and to see how the kids would like the route (their bikes have gears, but still). Bike: All-City Nature Boy Disc. And finally: school run. Bike: Surly Big Dummy. Home from camping I figured I’d end up doing another silly little spin. But I ended up doing a proper bike ride to keep the birthday weekend going with to-go sushi. I went to the fancy place in our neighborhood where we’ve only been once before, back on my birthday. 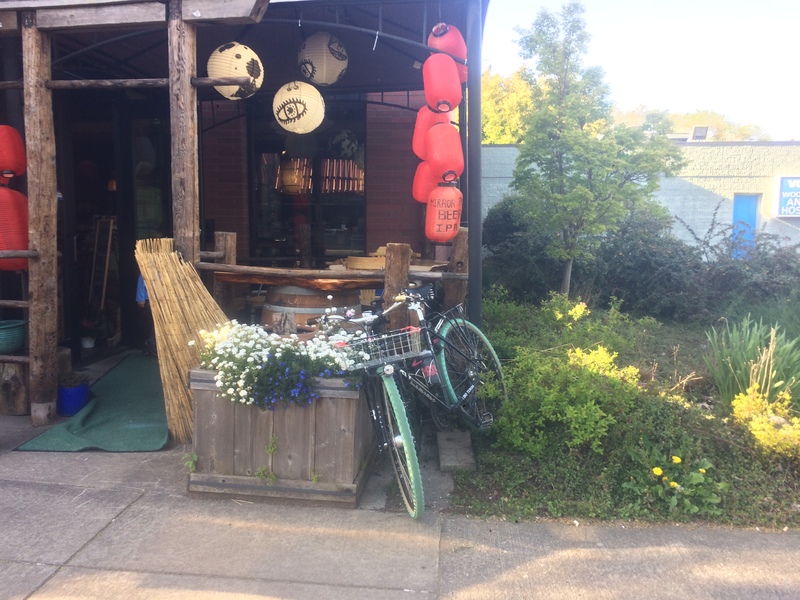 That day I was on my Big Dummy so I locked all the bikes to it out front and didn’t even notice there’s no bike rack on that block. I didn’t want to park a block away so I shoved my bike in the bushes and locked up to the fence.